Still hundreds of miles from the U.S. border for these three migrants. MEXICO: A caravan of Central American migrants that has drawn frequent Twitter tirades from President Donald Trump ahead of the US midterm elections rested and regrouped Monday at a stadium-turned-shelter in Mexico City before pressing on. 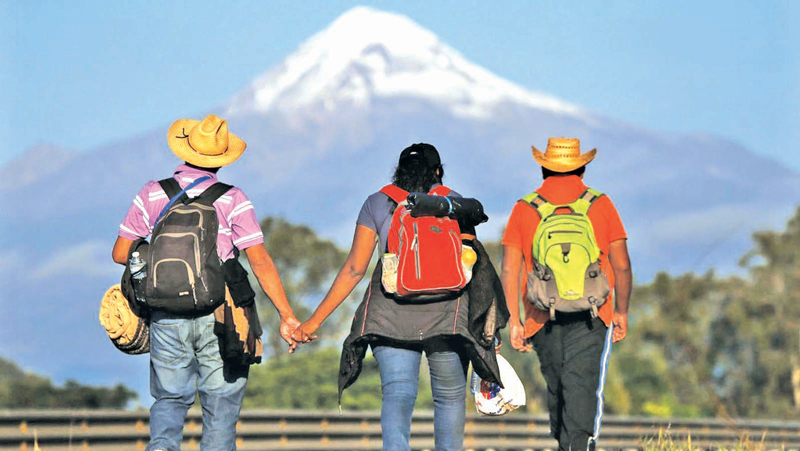 With their sights set on reaching the United States, some 5,000 migrants, mainly from violence-plagued Honduras, El Salvador and Guatemala, are expected to converge on Mexico City in the coming days and then continue their northward trek, authorities said. The first 470 arrived Sunday in Mexico City and spent the night at a stadium on the capital’s east side, where authorities have set up a large camp to host them and provide food and water. By Monday evening, some 4,000 people had arrived at the camp. Another 1,000 are expected to arrive by Wednesday, as the fragmented caravan regroups after dispersing across central and eastern Mexico, according to the National Human Rights Commission (CNDH). Often traveling in families or with young children, the migrants are sleeping in tents, on the ground or on the cement bleachers of the stadium, in frigid nighttime temperatures of around 12 degrees Celsius (54 Fahrenheit) in the high altitude of Mexico City. Many were nursing colds or mangled feet after a trek of more than 1,600 kilometers (some 1,000 miles) that began on October 13 in the city of San Pedro Sula, Honduras. “I couldn’t sleep. I was cold and coughing all night,” said Honduran Karla Membreno, 23, who is making the trek with her husband and sister-in-law. But “we have to be strong. God gives us strength to carry on,” she told AFP. Medical staff were attending to migrants and giving flu shots at impromptu clinics at the stadium. Other migrants were busy digging through large piles of donated clothing looking for coats, gloves or anything to fend off the cold. Two other large groups of Central Americans comprising between 3,000 and 4,000 migrants in all are currently making their way across the southern Mexican states of Chiapas and Oaxaca, the CNDH said. Another 3,230 Central Americans who were traveling by caravan have requested asylum in Mexico, according to the interior ministry. Trump has made immigration a central issue ahead of Tuesday’s key midterm vote, seen as a referendum on his presidency so far. Calling the caravan a “national emergency,” he has threatened to deploy as many as 15,000 troops to the border with Mexico. Some 4,800 had been deployed as of Monday, the Pentagon said. He has also asserted the caravan, which remains more than 1,000 kilometers (600 miles) from the border, includes members of the violent street gang MS-13 and “unknown Middle Easterners.” “The president of the United States sure threatens people a lot,” said Eber Josue, a 25-year-old Honduran migrant. “It makes us laugh. We’re not criminals. We’re hard-working people.” The CNDH said it had no evidence of criminals or people who could pose a security risk traveling in the caravan. Some migrants, however, said they were aware of a small band of young gang members in the group. “About 75 percent of (the caravan’s members) are women, children, the elderly and other vulnerable people. The rest are mostly young men with their families. There are very few traveling alone,” said Gustavo Rodriguez Zarate, head of migrant support programs for the Catholic archdiocese of Puebla. He said the migrants were traveling together to protect themselves from the many risks on the journey. Mexican gangs regularly extort, kidnap or kill Central Americans trying to reach the United States. Many of the migrants are fleeing poverty and insecurity in Honduras, El Salvador and Guatemala -- Central America’s so-called “Northern Triangle” -- where powerful street gangs rule their turf with brutal violence. They are still not exactly sure what route they will take, when or how.